Each year, hundreds of thousands of bikers flock to Florida for Bike Week, Biketoberfest, and to visit the country’s largest Harley Davidson dealership. Our roadways become filled with motorcyclists from all over the country seeking to enjoy the many motorcycle-related activities that Florida and Volusia and Flagler Counties have to offer. Unfortunately, hundreds of motorcyclists are injured while they are here, and, even worse, some are killed. Motorcyclists are extremely vulnerable to serious injury from crashes and from collisions with other vehicles. 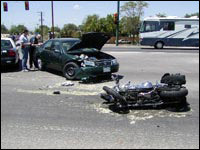 In fact, the vast majority of motorcycle accidents involve collisions with another vehicle. Motorcyclists are exposed to greater dangers than automobile drivers and passengers due to the lack of protection between their bodies and the road. Even the most minor of accidents can have devastating effects for a motorcyclist. Motorcycle accidents often result in a multitude of injuries, including broken bones, brain injury, internal injuries, and spinal cord injury, among others. In some cases, the motorcyclist does not survive. In fact, motorcyclists are much more likely to die or suffer serious injury in an accident than passengers in an automobile. Most accidents involving another vehicle occur at intersections and involve violations of the motorcyclist’s right of way. Most of these multiple-vehicle accidents are caused by negligence of the other driver. 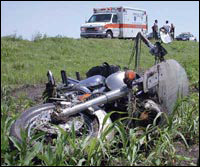 An automobile driver’s failure to see a motorcycle is the most common cause of motorcycle accidents. Other drivers often have trouble seeing motorcycles because of their size and position on the road, thereby increasing the chances of an accident. When drivers fail to see motorcyclists, they can cause accidents that seriously injure or kill motorcyclists, leaving them with severe injuries, massive medical bills, lost wages, and a damaged motorcycle. If you have been injured in a motorcycle accident, you may be entitled to compensation for your injuries. After a motorcycle accident occurs, many individuals are uncertain about what they should do at the scene and after they get home. If you have been involved in an accident, it is imperative that you take certain steps. Gather the following necessary information from all drivers and passengers involved in the accident: names, addresses, phone numbers, and automobile insurance information of everyone involved; and the make, model, vehicle information number, and license plate number of all vehicles involved. Record what happened during the accident to present to your attorney in case you decide to pursue legal action. Gather the names, addresses, and phone numbers of everyone at the scene who may have witnessed the accident so that your attorney can contact them while preparing your case. Contact an experienced motorcycle accident attorney. The experienced motorcycle accident attorneys at Rice will insure that you understand your legal rights and will work diligently to safeguard your interests. Compile medical records. If you sought and received medical treatment as a result of a motorcycle accident, keep a record of the doctors who treated you, as well as the time and place of treatment. If you went to the hospital for treatment, document how you were transported. Collect documentation of any relevant medical history to present to your attorney. After a motorcycle accident, most people are concerned about payment of their medical bills. Florida laws regarding motorcycle insurance differs from that for automobiles in that motorcycles are not subject to Florida’s No Fault Law. As a result, personal injury protection (PIP) is not available to motorcyclists. Therefore, your medical expenses are typically paid by your health insurance carrier. If you prevail in a personal injury action against the at-fault driver, your health insurance carrier will have a lien against the recovery for all medical expenses they paid out. Collision or property damage liability will often cover damage to your motorcycle. Because motorcycles are not subject to Florida’s No Fault Law, it is not necessary to meet the “tort threshold” of a permanent injury when bringing a claim against the at-fault party. This makes it less difficult for those injured in motorcycle accidents to collect for their injuries and damages. If you or someone you love has been injured in a motorcycle accident, you have a limited time to file a claim. The experienced motorcycle accident attorneys at Rice are well versed in personal injury laws and liability issues. Our attorneys can assist you in your personal injury claim against another driver or a manufacturer. We will work aggressively to determine the legal and medical issues related to your claim and to help you obtain the compensation to which you are entitled. Contact us today for your free consultation.